As you embark on your own education to learning the history of the Aboriginal Peoples in Canada, you also come across their Creation stories. These stories provide insight into their values and how they live. Elders pass down stories orally to the younger generation who carry these narratives forward. The story of Turtle Island comes from the Ojibwa/Anishinabe people. I had heard of it in fleeting conversations and during panel talks but was unaware of the exact meaning behind it. Essentially, after the Great Flood destroyed the Anishinabe People (Original People), the surviving animals find themselves resting on log surrounded by water. They determine that diving into the water to retrieve the earth is the only way to survive. Many try but the Muskrat ultimately sacrifices his life to successfully bring soil from the bottom of the ocean. Nanaboozhoo took the piece of Earth from Muskrat’s paw. Just then, the turtle swam forward and said, “Use my back to bear the weight of this piece of Earth. 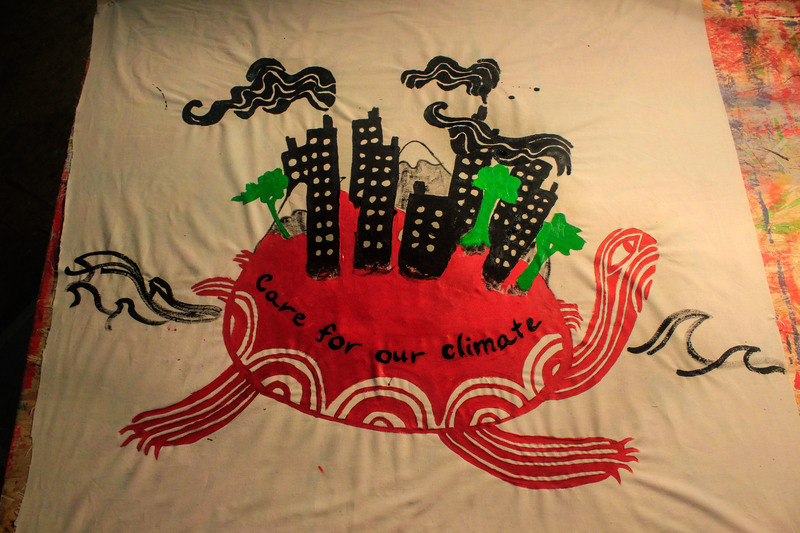 With the help of Kitchi-Manitou, we can make a new Earth.” Nanaboozhoo put the piece of Earth on the turtle’s back. Suddenly, the wind blew from each of the Four Directions. The tiny piece of Earth on the turtle’s back began to grow. It grew and grew and grew until it formed a mi- ni-si’, or island in the water. The island grew larger and larger, but still the turtle bore the weight of the Earth on his back. Nanaboozhoo and the animals sang and danced in a widening circle on the growing island. After a while, the Four Winds ceased to blow and the waters became still. A huge island sat in the middle of the water, and today that island is known as North America. Unexpectedly, it was a pleasant surprise to help my friend Kai paint the banner. Kai and his partner created this design to carry during the Jobs, Justice, and the Climate March taking place on July 5 in Toronto. In considering the demands for climate justice at this march, it’s interesting to reflect on how we have exploited the resource on the turtle’s back and continue to threaten the lives of the Earth’s second people. How long will the turtle bear the weight of our pursuit of reckless and unsustainable economic growth ?